If you see any suspicious vehicles or activity, please report it to the station on 01526 342581 (ask for the RAF Police Flight or guardroom). Located in Lincolnshire on the Southern edge of Coningsby village, near the A153/A155 junction, around 14 miles North-East of Sleaford. 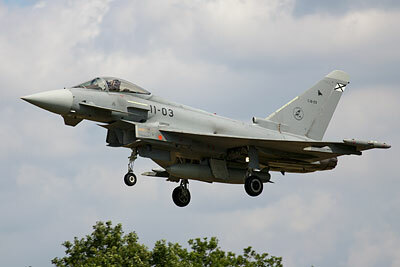 Only around half an hour's drive from RAF Waddington and RAF Cranwell. 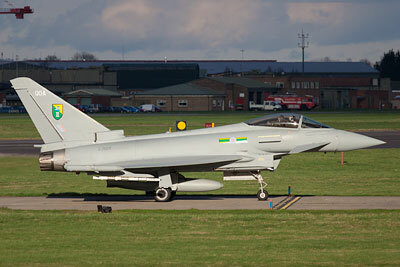 Coningsby is the RAF's first Typhoon station, and is the Southern QRA (Quick Reaction Alert) station with a pair of Typhoons on constant alert to respond to airborne situations of interest. 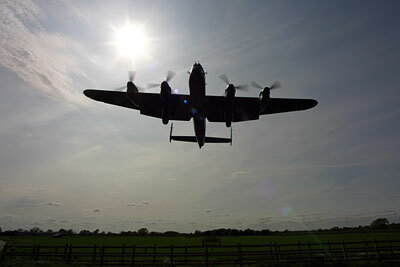 Coningsby also has the added attraction of being home to the Battle of Britain Memorial Flight (BBMF); in fact the BBMF hangar is open to the public on weekdays - well worth a visit. PLEASE NOTE: there have been some incidents of damage to fences, people walking across crops on farmers fields and laying large ladders against the perimeter fence. Please DON'T do these things - you are only damaging your own chances of easy viewing in the future! ALSO: do NOT drive your car into the farmer's fields beyond point G or at point M - if the farmer sees any more cars parked here he will block off these areas entirely and two of the best spots for photography will be lost! Typhoon T.3s and FGR.4s of 3(F), XI, 29(R) and 41(R)) Squadrons; the Tornado GR.4 of 41(R) Squadron (the Fast Jet & Weapons OEU) plus the Lancaster, Spitfires, Hurricanes, Dakota and Chipmunks of the BBMF if you're particularly lucky. Foreign visitors are now rare due to the closure of the ACMI range. 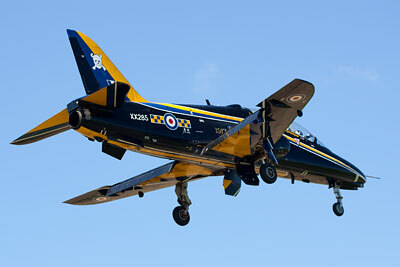 Aircraft from other nearby RAF stations make occasional approaches or practice landings, e.g. King Airs and Tutors from Cranwell. The occasional F-15 from Lakenheath also pops by. Flying here is almost always on weekdays only and normally limited to between 9AM and 6PM, though occasional launches are made after that time. On a good day it can be wall to wall action, with never more than half an hour or so quiet. The good news is that the Typhoons rarely simply arrive home, land, and shut down - they usually make a pass to break into the circuit and then any combination of overshoots or rollers that they feel like before finally landing for good. As with many RAF types, multiple Typhoons like arriving in close formation giving nice photo opportunities though this is not as common as it has been in the past. 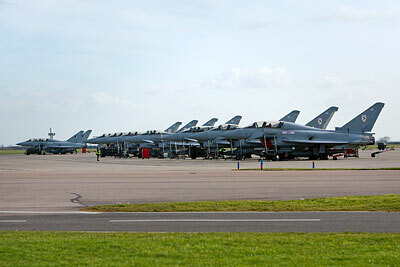 A poor time to visit Coningsby is a Friday afternoon, when flying is at a minimum as all the aircraft are being towed into a hangar for the weekend! Approaching from the A153 (Sleaford direction), you'll pass through Tattershall and enter Coningsby village. Head South on the minor road from the junction that is clearly signposted for both RAF Coningsby the Battle of Britain Memorial Flight. 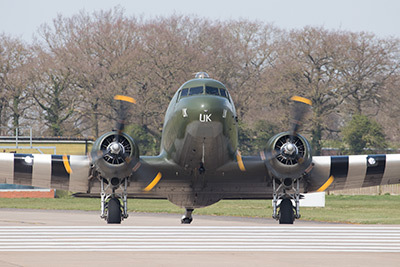 You will soon approach a mini roundabout, go straight on (signposted for the BBMF). You will pass through a residential area and then the station will appear on your left - a view of hangars and other buildings, and a collection of ordnance belonging to the BBMF. There is a wash pan here so occasionally you may see a jet parked up being cleaned. Soon you will reach the BBMF hangar where you will find a small parking area next to the fence on the left (Point A); thoughtfully provided by the RAF - there's even a board here listing expected appearances of the BBMF aircraft at airshows etc. Please take note of the other sign here, and don't litter or park on the road itself. From here a short walk along the fence to your right will enable you to read off any aircraft in the hangar right in front of you, and on the Aircraft Servicing Platform (ASP) which is to your right. The ASP is usually heaving with Typhoons but visiting aircraft can park here too. The odd aircraft may be visible across amongst the Hardened Aircraft Shelters (HAS) on the other side of the airfield too. Photos can be taken of visitors on the ASP through the fence, a 200mm lens is sufficient if they're at the near end, but bigger is better and if there's a lineup of aircraft the ones nearest you will obscure the rest. In the morning the sun will make this a tricky proposition anyway. Now hop back in the car and continue South on the road; there's another small layby on the left offering limited views of the ASP, but just round a bend you'll see the proper viewing area on the right (Point B). This is one of the old pan handle dispersals and has been surfaced with gravel and provided as a viewing area thanks to the council, the MoD and the EU. From the viewing area you can get reasonable landing shots of larger aircraft approaching runway 07 with a 300-400mm lens but bigger is better, and you need to be as far over to the right of the viewing area as you can get really. Much better shots can be had a little further along. Point C is the entrance to a field and also entrance to the fenced-off part of this old dispersal. There is a pile of gravel further back (the last resting place of a Lightning that met its end during a major disaster exercise some years ago) and this can make a good vantage point later in the day when the sun has moved around. It puts you closer to the approach line but the local farmer is apparently not spotter-friendly and may try and move you on if you hang around in the field entrance - better off on the gravel. A short walk to the airfield fence and using a stepladder will also give you clear side-on shots of aircraft taxiing to runway 07 or off from runway 25. Watch out for the ground here though; like much of the surrounding countryside it is very soft and has a nasty habit of suddenly collapsing under the feet of your stepladder! 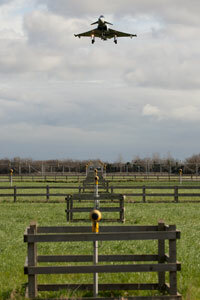 From here it is a short walk to the fence that goes along the end of runway 07 (D) and an experience you won't forget. When landing on 07, aircraft will pass over your head here at about 50 ft altitude, and the noise and jet exhaust fill your world. If anything goes wrong you're toast of course! Just about any length of lens will do for these shots, even a 28mm lens will get you a good shot as they get closer to you though they'll be shifting pretty fast! Late afternoon the sun becomes bothersome here though even then the resulting silhouettes can look suitably dramatic. 'Improvements' to the fence since the Tornado days mean you need a ladder to get shots of departing aircraft with their reheats lighting up - though the Typhoons don't need reheat for take-off so rarely use it, and when they do, are usually further down the runway. Trying for such a picture also means putting up with a faceful of jet exhaust for a minute or two - probably not a good idea for anybody with asthma. The resulting heat haze also means you have only a few seconds to get a reasonable shot of course. What this spot really excels at in the afternoon is nicely lit shots of aircraft taxiing on or off the runway at this end. You can get touchdown shots in the same way, but I would not advise spending much time here - fence panels have been knocked down by jet blast, so far without injury but some cameras have come off badly! A little further down from the centerline you'll find a track going into the field on the west side of the road (E), which offers an alternate angle on approaching aircraft. However, you are likely to be moved on if you park here (and risk the farmer's wrath), and it is still pretty close to the centerline. It's much better to continue further on, and pull in on the left just by the edge of the airfield fence and just before the traffic lights - there's a lane going down past the fence (F) where there's room for quite a few cars to park (either further down the lane when it widens out, or to the right-hand side of the lane entrance. A walk down the lane will find a mound (G) which gives an excellent view across the airfield from the top. There is limited parking available down this lane too; but do not drive past the mound itself as the grassed area beyond is a conservation area and easily damaged by vehicles. While it's too distant for photos of the ASP, it's excellent for approach shots when runway 07 is in use. When 25 is in use this can be good for take-off shots if aircraft stay low, however the Typhoons and even the BBMF types are generally well airborne and climbing rapidly by this point. Anything taxiing to/from the southern HAS complex can be seen easily (particularly good for photos though the fence obscures things as they go further to your right). A large ladder situated nearer to the fence itself can give you a clear view but, as usual, do not rest your ladder against the fence! This spot is very exposed and in winter any wind can make life highly unpleasant! For one more spot at this end of the airfield, drive South down to the tight turn in the road and park up somewhere, then follow the footpath along the side of the river to point H. While landing aircraft are a bit higher here, on a good sunny day the reflections from the water can light up an aircraft's undersides in a pleasing manner. The HAS area on the south side is a more difficult place to spot from. To get there, back in the car and continue round the very sharp left hand turn at the bottom-left of the map, towards Hawthorn Hill. You'll come to a crossroads with signposts; take a left and then follow the road round to the right at the top. Along this road you have limited and distant views, usually through high chainlink fencing. Taking the track up to point I you may be able to see the 11 Sqn mascot - a Lightning F.6. This has now been located outside one of the hardened aircraft shelters for some time so cannot be photographed from here any more. Continue along this track and you'll pass crash gate 5 on the corner; take a left to continue looking for stuff among the shelters (point J). There is a point about mid way along this lane where you have a clear view of the taxiway between the two groups of shelters here - excellent for profile shots of taxiing Typhoons. There are no clear views of aircraft parked outside shelters though for the number crunchers you may be able to read them off. This approximate area can also be useful for flying shots on a few particular days a year... whenever there are air displays in progress. With the BBMF being based here, they practice regularly - particularly in the couple of months before the air display season really kicks off. In recent years Coningsby has been the venue for the RAF's display qualification days - these are when most of the RAF display acts perform in front of senior officers to get signed off for the year. 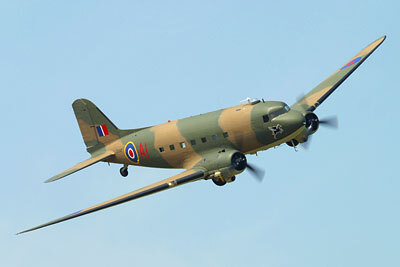 Usually held in late April, there is also another day on the calendar worth looking out for - the Coningsby Families Day. As all displays are aimed at the audience north of the runway, they carry out most of their manoeuvring overhead the HAS complex and surrounding area hence why this area can be good for photos. Go back down the track towards Scrub Hill and turn left towards New York (yes, the one in the US should really be called New New York!) and then, when there, turn left by the church onto the B1192. After a while there's a lane on the left called Reedham Lane, which leads to crash gate 4 (K). There are some field entrances near the end which you can park in, just don't block the entrance - the farmer here is apparently a much friendlier chap and has been known to even pull spotters out of ditches with his tractor when they've had slight navigational errors while watching something scream in overhead. The mud here when the weather has been wet is very soft - don't try parking on it unless you want to get stuck, and when walking, keep to the edge of the field! This can be an excellent spot to take photos from though you will have less opportunities than at other locations. While your view of most of the airfield is obscured, the photo opportunities are numerous - aircraft landing on 07 complete their landing roll on the runway within easy range of a 300mm lens (through or over the fence), aircraft overshooting or taking off are above the fence by the trees, aircraft breaking into the landing pattern do so above your head, and sometimes aircraft scream in from the 25 end when initially arriving home from patrols over the North Sea regardless of which runway is in use. 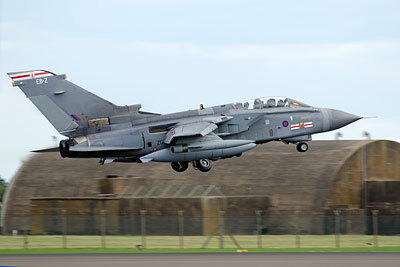 Of course when 25 is in use you have similar shots of initial touchdown (through the fence) and overhead arrivals. 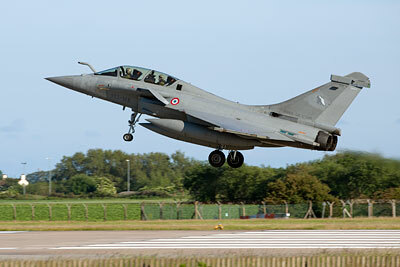 It's also another useful spot during air displays. The sun is behind you pretty much all day here. 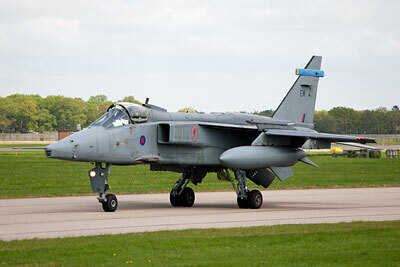 There is also a taxiway next to the fence here, a shorter lens will get you some good taxiing shots from aircraft going out to runway 25 or coming back from runway 07 (mostly 3 and 11 Squadron Typhoons). You will need much more than a stepladder to see over the fence - minimum of a five step ladder, ideally more. To get to the 25 threshold go back out the way you came in and turn left onto the B1192 again. Head north on that and the 25 approach is clearly visible thanks to the traffic lights. There is a no parking restriction in force (double yellows) on this stretch, which includes the verge itself, but there is a rough layby on the left (point L) - the usual potholes/gravel/mud mixture but the cops seem happy for you to park there. They don't appear to be too hot about picking people up for parking on the verge elsewhere - however be warned it can mean a ticket, so it may be better to try and find somewhere nearby to park and walk back to the fence by the runway end (and bring a stepladder!). It's common to see the verge covered with cars when anything exciting is happening though! While approaching aircraft are obviously easy to photograph here, happily aircraft taking off don't always just climb out in a straight line, they sometimes bank hard to the right giving further photo opportunities. A lens in the 300-400mm range can get you shots of aircraft taxiing onto the runway end here, but - you guessed it - you'll need a stepladder to see over the fence, and heat haze will often ruin the shots. If you want photos of anything taxiing out of the southern HAS complex, or a closer look at aircraft lining up on the runway, go for a walk (that's walk, not drive!) along the field edge to the taxiway corner (M). The farmer has deliberately left the a wide uncultivated area at the edge of this field so people can use it for viewing, but if you abuse it by driving your car down here or by leaving litter he will block all access - so please treat the area with respect. 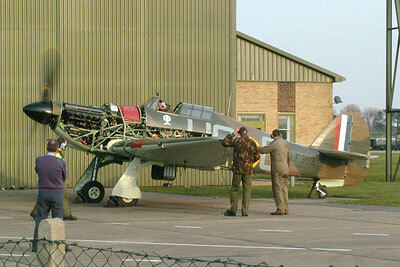 You'll be shooting through a chain link fence unless you really want to lug a huge ladder with you (minimum 5 step size or more - if you do, please don't lean it against the fence - this will attract the attention of the RAF police in short order). Also please note that the farmer does not mind people using this corner of the field but you must stick to the edge of the field and not take a short cut across it! As well as head-on shots down the taxiway, you can get good side-on shots (morning only because of the sun position), and this is also the closest you can get to the runway end for shots of aircraft beginning their take-off roll. For aircraft joining the runway from the northern taxiway it isn't ideal as the lie of the land means their wheels are usually obscured for much of the time - a ladder definitely helps with this. Offering more parking space, if the farmer doesn't object, is a track running alongside the approach lights (N). It's also a good place to take head-on photos of anything landing. While here you may notice that the Typhoons and other visiting fighter types often fly quite a tight circuit and bank hard over just East of here. Rather than go for a long walk along the track, back in the car, drive North and take the first right heading back South. The double yellow lines on either side of the road will alert you to when you are under the approach, and just South of here (O) you may get lucky with some nice top-side photos of fighters banking onto finals. Obviously you can't park by the roadside here, but if you call in at High House Farm and ask for Paul, he'll let you leave your car in the farm yard there. Be warned - it's hit and miss waiting for that topside shot! Back in the car, rejoin the B1192 and continue North; you'll see the old bomb dump on your left, and you can either turn in here and follow the track that goes along the northern edge of the dump, turning left at the corner, or if a disused bomb dump makes you nervous (!) continue on the main road a bit further and turn into Cross Keys lane - this leads to a crash gate on the Northern side of the airfield (P). There is barely enough room here for cars to park off to the side of the lane near the gate. It can be a good spot however - after about 14:00 in winter the sun has moved far enough to your right to not be too problematic for runway shots, and this spot gives you superb close-up shots of anything taxiing to/from the ASP earlier in the day. The runway is well within range of a 300-400mm lens; good for stuff landing on or departing from 25, not bad for stuff landing on 07 too. Typhoon departures from 07 will be a little high by this point but may produce passable pictures with a larger lens. Trees and the arrangement of the shelters on the other side of the airfield make getting serials impossible from here, unless stuff taxis out - in which case you'll see it on the runway shortly anyway. The fence here is wooden slats again, and a small set of steps is necessary. Back up the lane and turn left onto the B1192 again. At the top there's a garage which is your nearest comfort stop when at this end of the airfield, with a small shop and toilets for the desperate spotter (point Q). When larger types are landing on 25 they sometimes carry out a circuit that takes them North of Coningsby, so when they turn onto base leg they do so not far from here - with a really big lens, you may get lucky with a good topside shot but it really would need a big lens! Continuing our tour, turn left onto the A153 and continue back into Coningsby village. 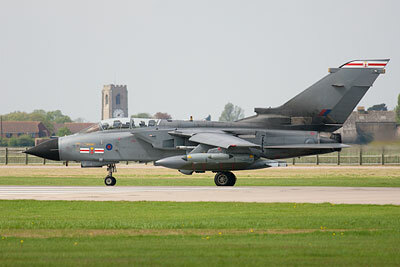 Back to the roundabout mentioned right at the beginning, follow the sign for RAF Coningsby this time. You'll pass the main entrance to the station. Keep to the right when the road forks and you'll come to crash gate 1 (R), this time with much more room for cars to park without blocking the gate. Similar views to the previous crash gate, but not as good for stuff landing on 25. The fence is a mixture here, with wooden slats on the left and chainlink on the right, so you can at least sit in your car and watch through the fence unlike at the other crash gate on the northern side of the station. Typhoons are already airborne by this point when using 25; the sun position means it's really only a good option late on a summer's day. Ideally a stepladder is needed to see over the fence, but there is also a mound of earth behind you which you can stand on. Drive back to the roundabout, turn left and follow the BBMF sign once again. 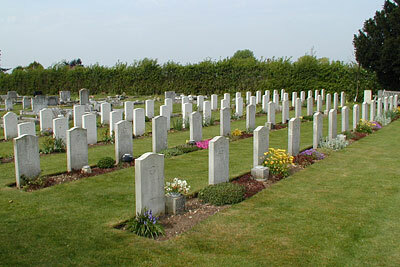 Before you get to the BBMF car park, you'll see a graveyard on your left (T). In the North-Eastern corner are the final resting places of so many of the young men who flew from here. It's worthwhile paying a visit - and your respects - I feel. 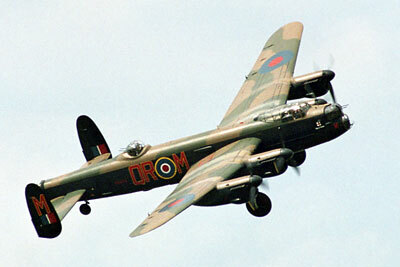 Why not combine it with a visit to the BBMF hangar for an appreciation of the aircraft they flew? That's it for Coningsby, one of my favourite stations for photographic opportunities (particularly so now that the real stars of Coltishall and Cottesmore have fallen quiet). To get the best out of the place you really do need to get your walking boots on and bring a stepladder, but it's well worth the effort. The threat of monotony from just one based type - the Typhoon - is relieved by the BBMF and various visiting types, plus the occasional QRA launch! The overall attitude of the station seems to be very spotter-friendly. The north-east crash gate isn't used much so you may attract a visit from the RAF Police but once they realise what you're doing they seem to leave you alone. Petrol available by the A153/B1192 junction (a toilet also being available at that garage), also in Coningsby and Tattershall villages (high prices for this area of the country though). There's a chip shop in the village, Chipmunks, but it is now apparently only open in the evening. For a sit-down or take-out meal, then, there is a cafe just round the corner - Pennys Place Cottage Cafe. Thankfully the cafe came under new management in early 2004, as prior to then it was best avoided - we're delighted to report this is now not the case! 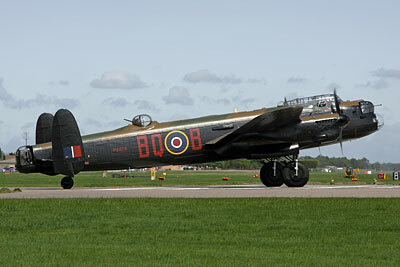 In the heart of Bomber Country, Coningsby is surrounded by other attractions that are worth a visit, such as Thorpe Camp just up the road from Tattershall (keep going up the road and you'll see the magnificent Dambusters memorial in Woodhall Spa too) and the Lincolnshire Aviation Heritage Centre at East Kirkby. 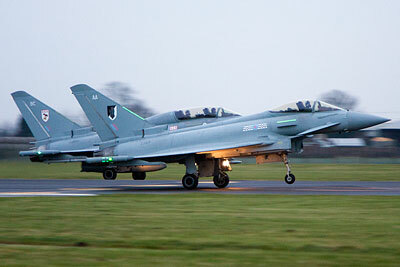 Both are only a short drive from Coningsby. 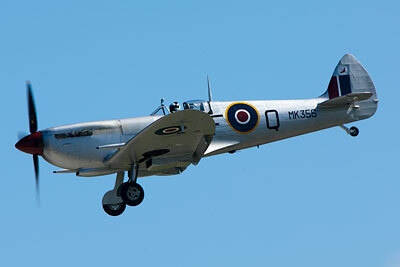 Contributors: author, Nick Challoner, Allan Barley, Mike Anderson, Gary Parsons, Fighter Control forum.